Hey friends! 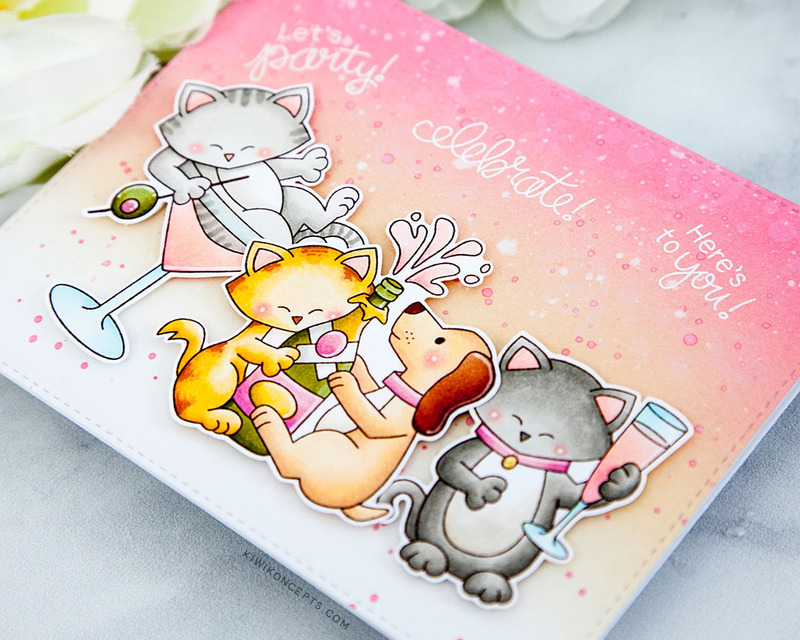 As promised, today we are having the Deck the Halls with Inky Paws Blog Hop! And I’ve created quite a celebratory scene in today’s project featuring the cute new set, Newton Celebrates. Let’s party! 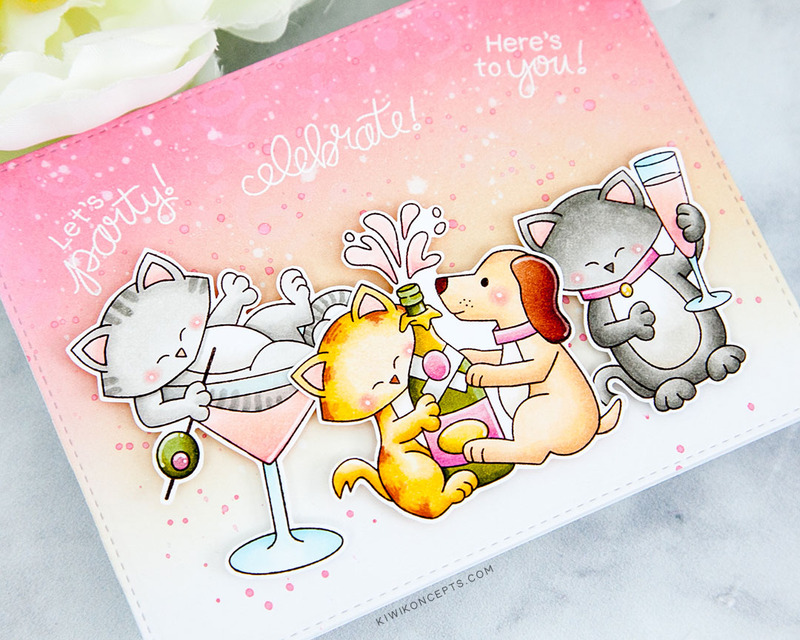 There’s no doubt that these animals know how to throw a celebration! I stamped all the cute critters in the stamp set in a dark brown hybrid ink and colored them up with copic markers. I always love adding some patterns to their coats. I also used a white gel pen for some accents. Then, I fussy cut the images out, however there are coordinating dies available for this stamp set that will likely do a better job than my fussy cutting. I decided to color all the drinks light pink cause, well, it’s all about rosé all day! Haha! I coordinated it with an ink blended background using Worn Lipstick and Antique Linen distress oxide inks and gave it some splatter for a fun effect. Rather than pick one sentiment, I used 3! It was like each of the cats yelling out their own cheer. The sentiments were heat embossed in white. 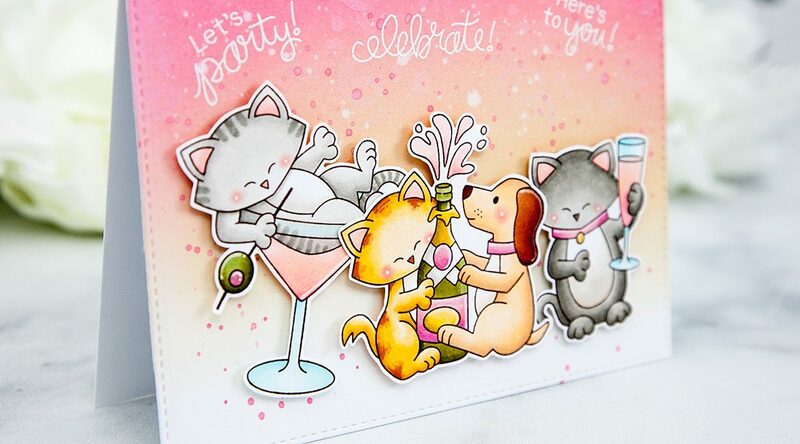 The background was die cut out with a stitched A2 frame, and the party animals were added to the card with foam. All done! Promotional alert! 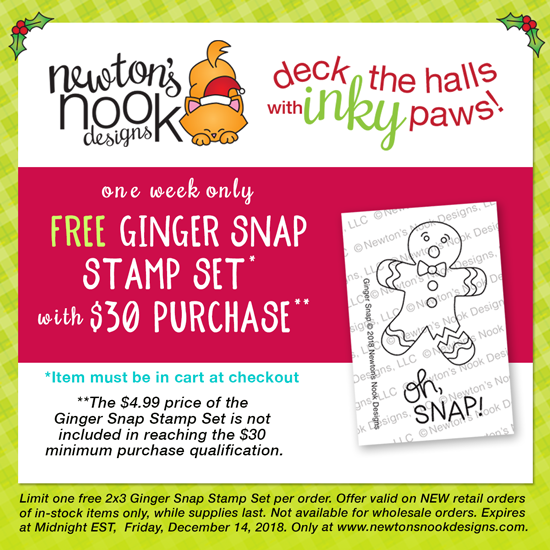 Newton’s Nook is having a special NEW 2×3 “Ginger Snap” stamp set that will be FREE with a $30 purchase starting today! This special promotion expires on Friday, December 18, 2018 at Midnight EST. 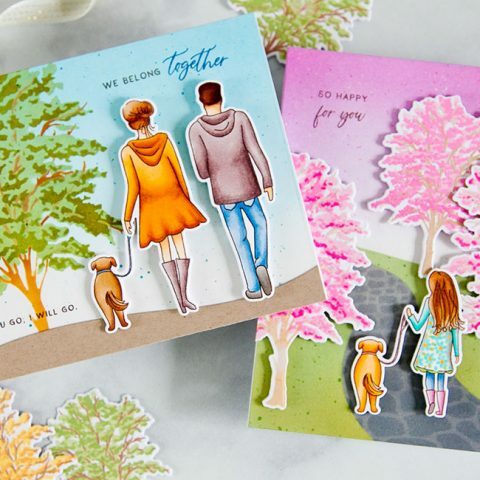 As part of this fun blog hop, Newton’s Nook will be choosing two lucky winners to win a $25 store credit for Newton’s Nook Designs online shop! 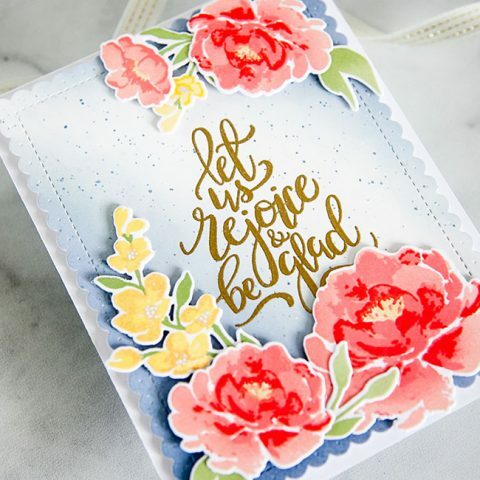 To enter, just leave comments on blog hop participant blog posts (listed above). The more love you leave, the more chances of winning! Leave your comments by Sunday, December 9th at 9pm EST, and winners will be announced on the NND blog on Monday, December 10th. Good luck! Newton’s Nook Deck the Halls with Inky Paws Week! This card looks absolutely fabulous! Love your color choice!!! 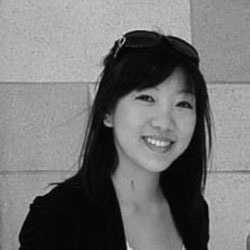 Wow, what a stunner, your inking is so gorgeous and I love the scene you’ve created! Your backgrounds always amaze me Keeway! I love this card so much! What a fabulous card! I’m loving all of the pink. Your coloring and background are purr-fect! Omgosh! I love this card!!! I like how you colored the kitties and doggy so softly. They look adorable. Love you inky background and wonderful coloring. Fun card! 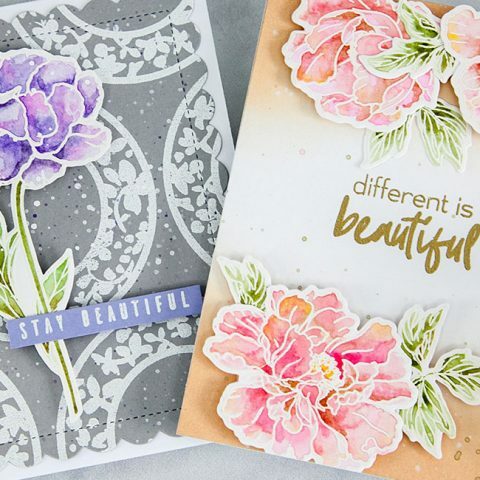 Your inky background and coloring look fantastic. Fun card! 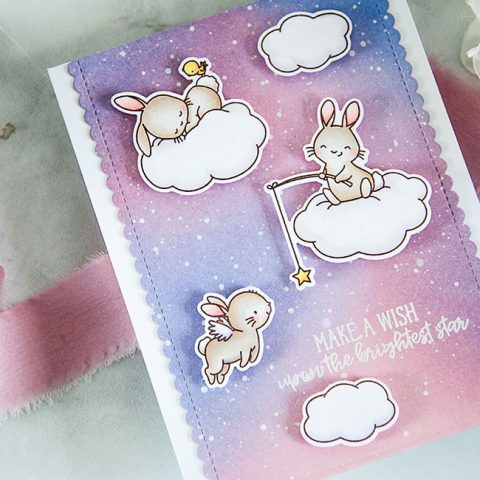 Such a darling card! Love the colors for sure too! Happy Holidays to you and yours! This is so adorable! I love the pink drinks! Thank you for being a part of our hop today! Looks like all the cute Newton characters have having fun toasting in the New Year on your festive card! 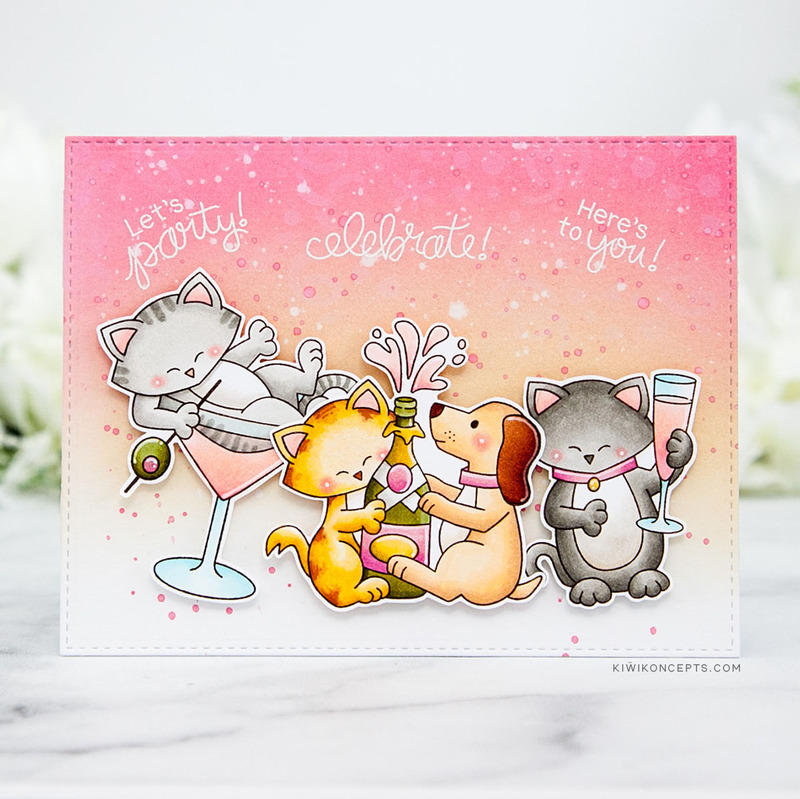 Cute, fun and festive scene! its so very adorable and gorgeous at the same time! 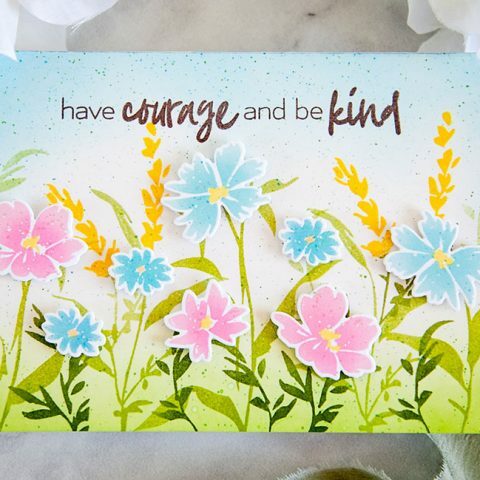 Love your card, the colors are so beautiful, the scene is super fun! 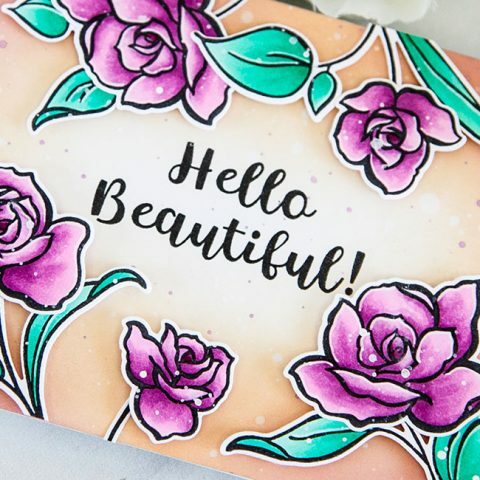 Your distress ink background is gorgeous and your comic coloring skills is exceptional! Cute critter party scene. Like the coloring. What a STUNNING background! I love the way you colored the kitties! Such a fun and happy celebratory card! Cutest card ever! I love kitties! This is absolutely adorable! What a fun and festive card. Cheers. Now that looks like a party I want to be a part of! Heehee. Adorable card. 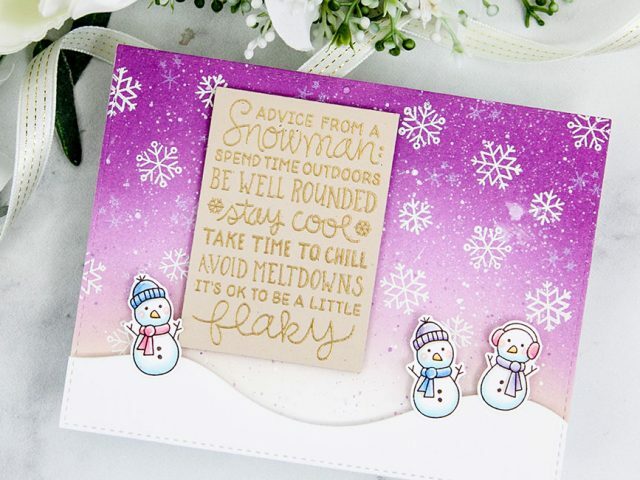 Your card is so fun and fabulous! I like how you used three sentiments.